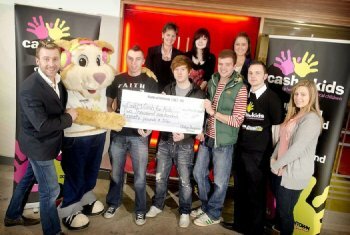 University of Ulster students have put their event management skills to good use and raised £2,000 for a local charity. The International Hospitality Management BSc students - based at the Ulster Business School, Belfast campus - planned, organised and staged an event of their choice to raise money for Downtown Radio and Cool FM’s Cash for Kids. The charity promotes the social, physical and mental wellbeing of children and young people throughout Northern Ireland. The fundraising events ranged from a cabaret night featuring May McFettridge in the Academy Restaurant, Belfast campus to speed dating in Scratch nightclub to a 007 evening in CafÃ© Vaudeville. Darren Fowler, the Cash for Kids Charity Manager, helped to mentor the students during the planning stages. The charity focuses on improving quality of life and encouraging both personal development and aspirational fulfilment. All funds raised will be distributed to provide relief from illness, disability or disadvantage among children aged 0-17. Caption: Event Management students present a cheque to (front row l-r) Downtown Radio and Cool FM’s Cash for Kids charity manager Darren Fowler, Cool FM Courage the Teddy, students Chris Dunne, Thomas Carson, Jamie Gilmour, Jordan Madden, and Jordan Davidson, (back row l-r) lecturer Nikki McQuillan, Ellen Havlin, Laura Devlin.